Feminist TV channel to empower women in the Mediterranean countries. 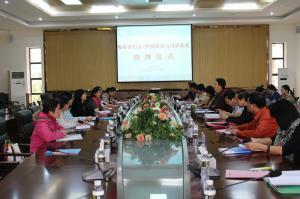 Women, Gender Research Base Opens in Hainan Women of China The Hainan Women&Gender Research and Training Base was established at the Qiongzhou University in south China’s Hainan Province on December 17, 2013. An opening ceremony was held by the Hainan Women’s Federation and Institute of Hainan Women and Children Issues Research Centre, followed by a seminar to discuss further cooperation and research orientations. This research and training base is one of the first bases in Hainan Province aiming to promote research into issues such as women’s marital status, ethnic minority women, and women in science and technology. Feminist TV channel to empower women in the Mediterranean … Your Middle East The first Euro-Mediterranean TV channel with the aim of promoting gender equality and empowering women within the Union for the Mediterranean countries is about to be launched. “We will start broadcasting for 8 hours per day on the 8th of March 2014, which is the International Women’s Day. The administrative office will be in Brussels and the main one will be in Tunisia. We will have offices in different major cities including Beirut and Cairo”, says Lila Lefèvre, the director of Nissa TV (which means women TV) and the president of the Euromed Audiovisual Productions which is the body responsible for managing and promoting Nissa TV. The programs of Nissa TV will include reality shows that will directly engage its female participants in raising awareness about their rights and provide them with the needed expertise to practice their political, legal, economic and social rights pertinent to their emancipation. “We will focus on such type of programs which are better at making a change towards eradicating sexist ideologies and policies and achieving gender equality in society”, says Lefèvre. Previous postUK: Yes campaign struggling to attract women voters. Treat online abuse of women, girls as robustly as offline. Next postPromoting Gender Equality at the European Research Council.